This economy plastic service cart is a great value at a great price. 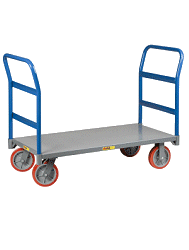 This service cart will hold up to 330lbs on its tray-shelves that are built to easily hold large items, supplies, tools, boxes, etc, with no risk of them sliding off as you move the cart. This model has two 16” by 30” shelves.